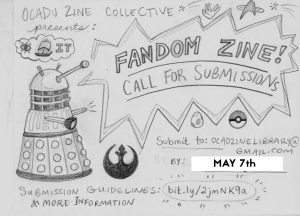 The OCADU Zine Collective is producing a collaborative zine about fandom, and they want your submissions! We will accept images, fiction and non-fiction writing, comics, poems and more! Formatting: Each page of the zine will be 8.5 inches x 11 inches in size. Please format your submission to fit this size. Each page of your submission should be submitted as a separate file. Please leave at least a 1/2 inch border on every page, meaning images and text should be centered on the page and no larger than 7.5″ x 10.” Please provide us with high quality files, with at least 300dpi/ppi resolution. The zine will be printed in two colours on the risograph. This means that each colour will need to be printed separately, one after the other with time to dry in between. If you would like to use both colours in your submissions, you can do one of the following: 1) submit each page as a Photoshop file, with each colour on a separate layer (max. two colours/layers). 2) Submit each colour as a separate PDF file. All of your files should be submitted in grayscale. Please title your files/layers as “lighter colour” and “darker colour” so that we know how you would like the contrast of the image to work. The OCADU Zine Collective thanks the OCADU Student Union for funding for this project.